Most likely all the women in the world have dreamt of a husband who will make a Taj Mahal for them complimenting their beauty and probably some of the men out there have agreed to build one but hasn’t done yet. Ladies, don’t mind but there is one man who has already accomplished this long time back i.e in 1893. 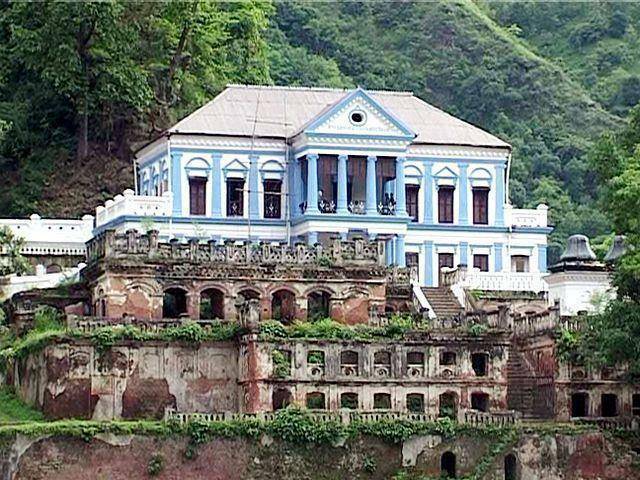 Ranighat palace or Rana palace in Nepal is the palace made by a king in the memory of his deceased queen. This palace is considered the “Taj Mahal of Nepal”, situated on bank of the holy river Kalighandaki over a huge rock. Don’t expect something has giant and mesmerizing as Taj Mahal but this place has a charm of its own. This place is not usually on the check list of most of the travellers’ hence all the more reasons to visit this place. No entries fees and if luck if might just have the full place to yourself. The soothing light blue of the building will make you appreciate its beauty even more with green surroundings and turquoise water in front. The place does not have many visitors therefore there is only one cafe taking care of the needs of the few travellers making their way to the palace. The cafe is a little over priced but hey!! They carry all the groceries on foot back to this place after the purchase. If you want to cool yourself off then feel free to take a dip in the river. But be aware of the ice cold water and the high current in the water flowing.